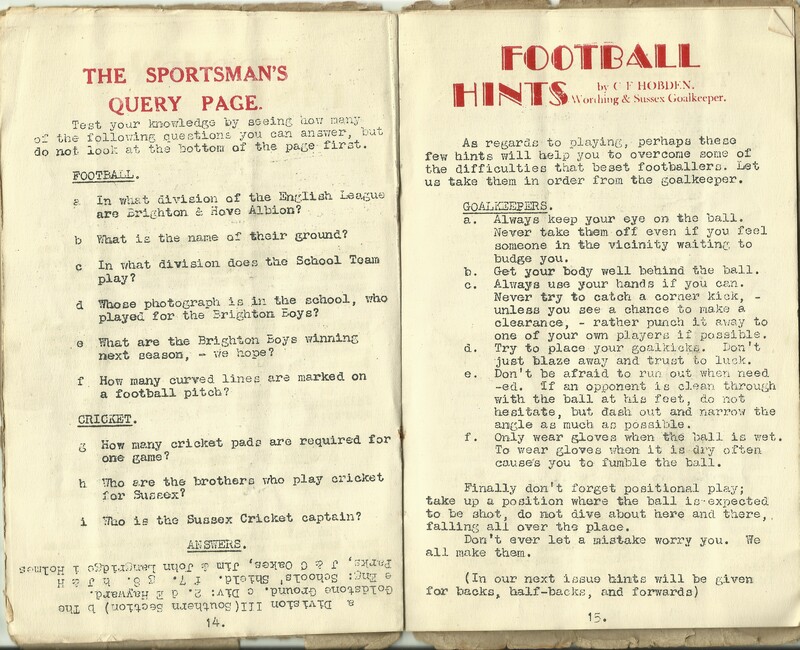 In the Park Street School Magazine from the summer of 1938 there is a short article on page 15, written by C F Hobden, Worthing & Sussex Goalkeeper, with some useful hints for goalkeepers! As regards to playing, perhaps these few hints will help you to overcome some of the difficulties that beset footballers. Let us take them in order from the goalkeeper. a. Always keep your eye on the ball. Never take them off even if you feel womeone in the vicinity waiting to budge you. b. Get your body well behind the ball. c. Always use your hands if you can. Never try to catch a corner kick, – unless you see a chance to make a clearance, – rather punch it away to one of your own players if possible. d. Try to place your goalkicks. Don’t just blaze away and trust to luck. e. Don’t be afraid to run out when needed. If an opponent is clean through with the ball at his feet, do not hesitate, but dash out and narrow the angle as much as possible. f. Only wear gloves when the ball is wet. To wear gloves when it is dry often causes you to fumble the ball. This entry was posted in Beginning life in Hove and tagged Park Street School. Bookmark the permalink.